Am I Hungry? Training for Mindful Eating Coaching - Am I Hungry?Am I Hungry? 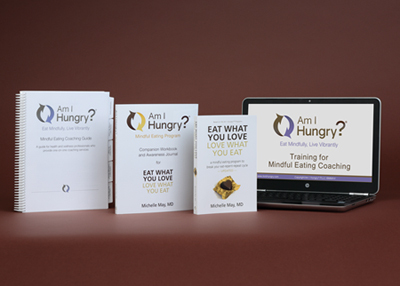 The Am I Hungry?® Training for Mindful Eating Coaching is appropriate for health professionals who provide one-on-one coaching in client or patient care settings. It provides the information, structure, and tools necessary for health professionals to help clients or patients resolve their problematic relationship with food, physical activity, and/or self-care. It is designed to support the successful integration of the Am I Hungry? Mindful Eating Cycle into one-on-one coaching work. Please note: This training does NOT provide training in basic coaching competencies and does not result in coach certification. Unparalleled personal and professional growth to take you to a whole new level! Continuing education credits are available. For more information and registration: Click here to download the complete Information Packet for the Training for Mindful Eating Coaching.